The CNG manual version and the petrol AMT version gets two variants each. Under the bonnet, the new Hyundai Santro gets a 1.1-litre engine. The new 2018 Hyundai Santro has finally been launched in India and with prices starting from Rs 3.89 lakh, has already attracted over 23,500 bookings before official launch. The Santro is available in five variants for the petrol manual i.e. D-Lite, Era, Magna, Sportz and Asta. The CNG manual version and the petrol AMT version gets two variants each – the mid range Magna and the very well equipped Sportz. On the inside, the Santro gets a fair few first in class features like a 7-inch touchscreen that gets Apple CarPlay, Android Auto and Mirrorlink and rear AC vents. But, as the title suggests, lets have a more in-depth look at the engine and gearbox that is offered on the new Santro. 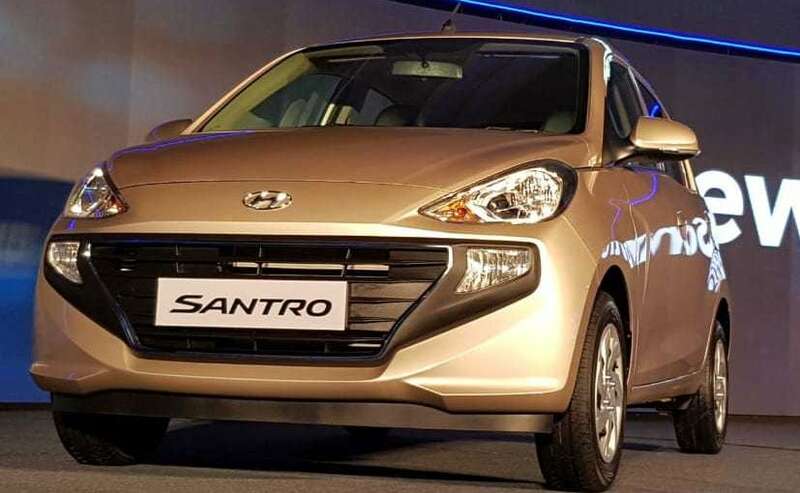 Under the bonnet, the new Hyundai Santro gets a 1.1-litre engine. The engine is a 4-culinder unit as compared to other automakers that are offering a 3-cylinder unit in the same category. The engine makes 69 bhp of peak power at 5500 Rpm and 99 Nm of peak torque at 4500 Rpm. We have driven the Santro briefly at the Hyundai test track in Chennai a few weeks ago and the engine does pull well through the rev range although a little bit better performance in the higher rev range would have been nicer. The engine is mated to a 5-speed manual gearbox or a 5-speed AMT automatic. The manual gearbox is the one I personally prefer as it is more fun to drive. Clutch action on the manual gearbox version is typically light and easy to use (as expected from most Hyundai cars). The 5-speed AMT gearbox on the other hand has been made in house by Hyundai and not a third party unit like the ones on Maruti or Tata cars. The AMT unit uses an electric actuator to shift gears and is nice to drive, especially at slower speeds. It does feel a little slow when you push the car hard though. The Hyundai Santro isn’t exactly what you would call quick but it does get a move on in the right gear. The 0-100 kmph time for the manual car is 14.5 kmph while the same in the AMT variant takes 16.6 kmph! The top speed for both cars is rated at 156 kmph. Fuel economy for the petrol version is rated at 20.3 kmpl. The Hyundai Santro CNG on the other hand also gets the same 1.1-litre, 4-cylinder, petrol engine and is mated exclusively to the 5-speed manual gearbox only. The car is downrated on power as compared to the petrol and makes 59 bhp of peak power and 84 Nm of peak torque. The CNG tank will have a capacity of about 8 kg. Fuel economy for the CNG version is rated at 30.48 kmpl.